When London is lost beneath the rising tides, unconscious desires rush to the surface in this apocalyptic tale from the author of ‘Crash’ and ‘Empire of the Sun’, reissued here with a new introduction from Martin Amis. Fluctuations in solar radiation have melted the ice caps, sending the planet into a new Triassic Age of unendurable heat. London is a swamp; lush tropical vegetation grows up the walls of the Ritz and primeval reptiles are sighted, swimming through the newly-formed lagoons. Some flee the capital; others remain to pursue reckless schemes, either in the name of science or profit. While the submerged streets of London are drained in search of treasure, Dr Robert Kerans – part of a group of intrepid scientists – comes to accept this submarine city and finds himself strangely resistant to the idea of saving it. First published in 1962, Ballard’s mesmerising and ferociously imaginative novel gained him widespread critical acclaim and established his reputation as one of Britain’s finest writers of science fiction. 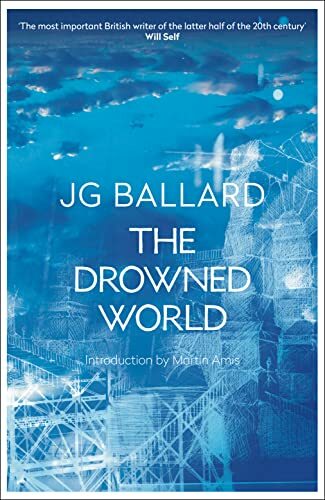 This edition is part of a new commemorative series of Ballard’s works, featuring introductions from a number of his admirers (including Robert Macfarlane, Martin Amis, James Lever and Ali Smith) and brand-new cover designs.